(May 1993) Clinton becomes first lady and she and her husband enjoy a warm reception from the public. "Positive reviews of Hillary Clinton's job performance run well ahead of evaluations made of the President… Women under 30 years of age were especially positive about Mrs. Clinton, with seven in ten expressing approval." (Feb. 1996) Clinton accused of improperly firing employees in White House "Travelgate" investigation. "While many Americans (48%) think that charges of possible misconduct leveled against Hillary Clinton are politically based, the first lady’s public image has nonetheless suffered. Currently, unfavorable opinions outweigh favorable views of Mrs. Clinton by a margin of 54% to 42%." (Aug. 1998) Bill Clinton admits to having an improper extramarital relationship with White House intern Monica Lewinsky. "In contrast to her husband, Hillary Clinton continues to draw high marks from the public. Two-thirds of Americans (66%) say they admire Hillary Clinton’s decision to stand by her husband and nearly as many (63%) have a favorable opinion of the First Lady." (Dec. 2006) Following her re-election, Clinton's favorability remained strong. Among Democrats, 55% viewed her as the leader of the party. (May 2008) Clinton’s overall favorability dips below 50% again after long primary season that creates divisions even among many Democrats. "Currently, about as many [Obama supporters] express a positive opinion of Clinton as express a negative opinion (49% vs. 48%). In February, favorable assessments of Clinton outnumbered unfavorable views by nearly two-to-one (64% to 33%) among Obama’s backers. … Obama’s supporters – by greater than two-to-one – believe that the continuing race is bad for the party rather than good for the party (61% vs. 27%)." 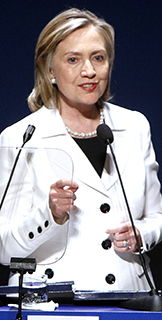 (Jan. 2012) Clinton advocates for gay rights and women’s rights abroad. The U.S. mission to kill terrorist leader Osama bin Laden succeeds in May 2011. 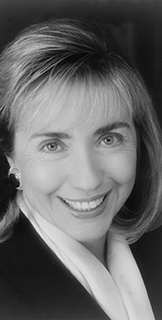 "The public continues to view Hillary Clinton positively. Fully 62% have a favorable opinion of the current Secretary of State while half as many have an unfavorable opinion (31%). These numbers are little changed from a year ago, and Clinton has received positive favorability ratings for the past three years since she became Secretary of State." (Dec. 2012) As Clinton's tenure with the State Department drew to a close, she was embroiled in controversy over the department’s failure to adequately address the security needs of the U.S. consulate in Libya. While her popularity matched other high points in her career it fell to 56% several months after she stepped down from the position. (Oct. 2013) For the first time in years, Clinton was out of government. But she acknowledged she was contemplating a second bid for the White House. In an Oct. 2013 speech to a business group on Long Island, Clinton said she wanted to “think seriously” about a 2016 campaign, but said she wouldn’t begin thinking about a possible second run until the following year. (May 2015) Hillary Clinton’s favorability rating has fallen since last August, when 58% had a favorable impression of her and 41% held an unfavorable view. Today, views of Clinton are divided: 49% have a favorable opinion of the former secretary of state; 47% have an unfavorable opinion. 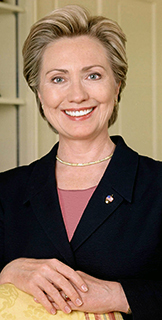 Clinton announced her 2016 presidential candidacy on April 12, 2015.